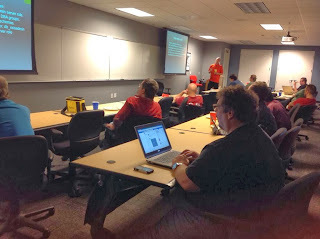 Tampa Hillsborough SQL User Group meeting. I spoke at the Tampa - Hillsborough SQL Server User Group meeting on Thursday, September 26, 2013. I presented "Cure your sysadmin addiction" covering how to strictly manage your SQL Server sysadmin role membership. The projector cooperated or I've gotten better at using one. Interestingly, I am presenting a PowerPoint presentation using LibreOffice Impress running on Ubuntu Linux 12.04 LTS. How's that for interoperability? Linux plays nice even with Microsoft formats. There were several good questions and a nice amount of discussion about the topic.